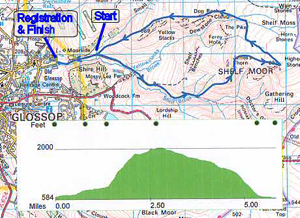 The John Hewitt Memorial Shelf Moor race is a tough category AS fell race, registered with the FRA. Please see the FRA Requirements for Runners. The route crosses rough and exposed moorland terrain. Runners should bring FRA `best practice’ kit. Notices at registration will indicate which of this kit will be needed on the day. The six mile route taken by the Shelf Moor race has three of the area’s aircraft wrecks within close proximity. One is at the top of the steep climb called James’s Thorn, the remains of which nestle in the peat on the 1800 foot contour. Another lies below in Ashton Clough while the B-29, “Overexposed” rests at 2038 feet, virtually the top of the Peak District. The views from the trig point there on a clear day are quite extensive. Markers are followed Northwards across Shelf Moor to the north the far side of Dowstone Clough. After the stream crossing, runners hurtle down the soft peaty terrain, and from Lightside emerge at the track that leads to the finish near the bus turning circle at the end of Shepley Street in Old Glossop. The course record was set by three times British Fell Running Champion Colin Donnelly in 1989 and is 39 minutes 45seconds. An excellent time for many on the flat, never mind adding the 1500 feet of ascent (and descent). Carol Greenwood of Holmfirth has the ladies record at 47 minutes 17 seconds from 1986. The race was first held in 1984 and, apart from 1995 when dry weather closed all the access land, has been held ever since. The race went ahead in the 2001 season after the foot and mouth epidemic had been resolved. Registration: The Scout hut off Hope Street, Old Glossop, GR SK042 949. Toilet facilities are available in the Scout Hut. Registration will open at 10am. Start Location: 15 mins from registration along the Mossy Lea track at the first closed gate (SK 053950). Please do not warm up in the field beyond the first gate, as it will contain sheep and/or cows that we do not want to disturb. Use the loos provided at registration, not the dry stone walls. Kit requirements: Please bring full FRA kit and be prepared to wear it. This includes waterproof top and overtrousers. Although the kit would probably not be needed during the race, in the event of serious injury (as occurred during the 2010 race) it can take a long time for Mountain Rescue to reach parts of the course. Directions: Travelling towards Sheffield on the A57 Snake road from the centre of Glossop, turn left onto Manor Park Road (signed on the day). Follow Manor Park Road (400m), bear right in front of the Queens Hotel into Shepley Street, and then immediately left into Wesley St . Scout Hut ~200m further on in Hope Street at the top of Wesley St. Please do not park in Hope St outside the hut. The road is narrow and we do not want to upset the locals. Parking: Roadside parking on Shepley Street and Manor Park Road. There is also a car park in Manor Park which is about 10 minutes walk from registration. Results from previous years can be found here. Really a good race ,well organised I have enjoyed it.many thanks to organisers . Thank you for a great race today. I really enjoyed it!